We have talked a lot about potential differences, currents, and resistances, but we have not talked much about how these quantities can be measured. Let us now investigate this topic. Broadly speaking, only electric currents can be measured directly. Potential differences and resistances are usually inferred from measurements of electric currents. The most accurate method of measuring an electric current is by using a device called a galvanometer. where is the horizontal width of the coil, and is its area. 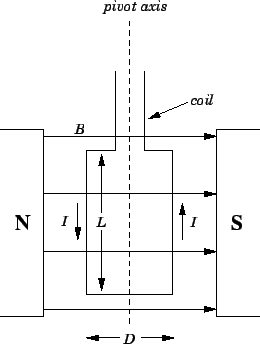 Note that the two vertical sections of the coil give rise to equal contributions to the torque. Strictly speaking, the above expression is only valid when the coil lies in the plane of the magnetic field. However, galvanometers are usually constructed with curved magnetic pole pieces in order to ensure that, as the coil turns, it always remains in the plane of the magnetic field. It follows that, for fixed magnetic field-strength, and fixed coil area, the torque exerted on the coil is directly proportional to the current . The coil in a galvanometer is usually suspended from a torsion wire. The wire exerts a restoring torque on the coil which tries to twist it back to its original position. The strength of this restoring torque is directly proportional to the angle of twist . It follows that, in equilibrium, where the magnetic torque balances the restoring torque, the angle of twist is directly proportional to the current flowing around the coil. The angle of twist can be measured by attaching a pointer to the coil, or, even better, by mounting a mirror on the coil, and reflecting a light beam off the mirror. Since , the device can easily be calibrated by running a known current through it. There is, of course, a practical limit to how large the angle of twist can become in a galvanometer. If the torsion wire is twisted through too great an angle then it will deform permanently, and will eventually snap. In order to prevent this from happening, most galvanometers are equipped with a ``stop'' which physically prevents the coil from twisting through more than (say) . Thus, there is a maximum current which a galvanometer can measure. This is usually referred to as the full-scale-deflection current. The full-scale-deflection current in conventional galvanometers is usually pretty small: e.g., . So, what do we do if we want to measure a large current? Clearly, if the full-scale-deflection current is much less than the maximum current which we wish to measure then the equivalent resistance is very small indeed. Thus, there is an advantage to making the full-scale-deflection current of a galvanometer small. A small full-scale-deflection current implies a small equivalent resistance of the galvanometer, which means that the galvanometer can be connected into a circuit without seriously disturbing the currents flowing around that circuit. Figure 32: Circuit diagram for a galvanometer measuring current. Again, there is an advantage in making the full-scale-deflection current of a galvanometer used as a voltmeter small, because, when it is properly set up, the galvanometer never draws more current from the circuit than its full-scale-deflection current. If this current is small then the galvanometer can measure potential differences in a circuit without significantly perturbing the currents flowing around that circuit. Figure 33: Circuit diagram for a galvanometer measuring potential difference.